Several of you have mentioned vehicles in this blog. That seems appropriate as memories of cars are probably one of the things most of us hold in common. Franklin Heide mentions several vehicles in his comments. In “Memories of Days Gone By”, he says, “I can't believe no one has mentioned THE RANGER yet!! Dip fries, malts, "fender roaches", etc. Those with cool cars just driving around & around & around with their fingers on the vent window, sitting low in the seat. Several comments relevant to vehicles can be found in the post “A Place for Miscellaneous Thoughts, or Simply Idle Chatter”. In response to Judy Stevens’ mention of Sidney Jones’ passing, Franklin commented, “Sorry to hear about Sidney Jones.” He went on to say, “Sid was a good guy (and a helluva good football player) who had the best of everything. His Mom & Dad had a 196? Fury, which Sid took out at times. Anyone remember his Grey Olds, customized & all? I notice in the Blog that Sonny referred to my blue Mercury. Well, I happened to find a picture of that gem and it is attached. Note the exterior is certainly not blue (a Sonny senior moment, I am sure), but I remember the interior was baby blue naugahyde. 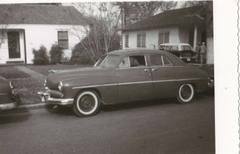 Since my folks had a very uncool Nash Rambler (which I was never allowed to drive anyway – and therefore I did not get a driver’s license until age 27 - what was the point? ), cars do not figure so prominently in my memories. But boy, Ed sure did love his cars. So I asked him to share a few of those memories with us. Said Ed: "Pretty girls in high school vied to capture the hearts of the high school lads back in the '50’s as they still do today. But the competition was fierce back then since many of us had a running “love affair” with our cars – or a longing for the ones we did not or could not have. And I plead guilty to this strange romance. I was one of those who received a driver’s license at the tender age of 14. Since we lived quite a distance from my school and I was involved in a number of activities, my parents decided to buy me a car at the end of my 9th grade year. I was the proud owner of a 1955 Chevrolet in the summer of ’56. However, it was the sedan version of this classic car, was a 6-cylinder and single tailpipe variety, and was a not-so-cool chocolate brown color. But it was mine and I drove it proudly for a couple of years. In my junior year, my dad decided to buy himself a truck and trade in their 1955 Mercury coupe – a hardtop convertible with a V-8 engine complete with dual tailpipes. I convinced him to let me have the Merc and trade in the Chevy instead. Fortunately, he agreed and I now had a much cooler ride for the rest of my high school days. However, the car was chartreuse (remember that color?) and white which was quite unacceptable. So, I saved up some money and modified the ride: removed the hood ornament and all other chrome fixtures on the hood and trunk and “leaded” it in; replaced the stock mufflers with glass-packs; lowered the rear end; and then had the whole car painted a gleaming black. You’ll have to imagine how it looked when transformed. 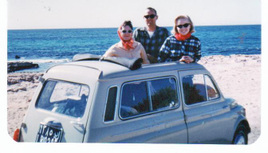 There were a few more memorable vehicles when Karla and I pulled up roots for a couple of years and moved to Benghazi, Libya (North Africa) in 1965 to teach school. Our first car was a very interesting Fiat 500 that was extremely small and only had a 2-cylinder engine. But it did have a roll-back roof liner and got great gas mileage – and it was cheap as well. We affectionately called it our ‘sardine can’. Here you see my brother, sister-in-law, and Karla viewing the Mediterranean sights through the roof opening. Later, we were fortunate enough to have the opportunity to purchase an older model Triumph TR-3 convertible (pictured outside our school building in Benghazi) with overdrive, racing shift, and a very powerful engine. We should have shipped this one back to the U.S. but could not afford it at the time. 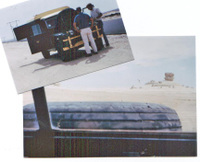 Then there was the Land Rover that was a necessary vehicle type for excursions out into the Sahara Desert, which was the back yard to everyone in Benghazi. Mechanics were few and far between and when things went wrong with your car you were often in trouble. This happened to us once out in the Sahara, as the picture shows. It was deathly hot, no shade anywhere, and water was scarce. Even though this was the only road into the Sahara in Libya, we rarely saw another vehicle or human being. We managed to take turns sitting in the shade of the Land Rover and a friend and I kept fiddling around with the engine until we got it going again late in the day. It was scary and I guess it was fortunate that we escaped what could have been an unpleasant situation. Now that Ed has completed his musings about memorable vehicles, I must add that when Ed asked me for our first date at Baylor in 1961, I was excited in part because at the time he asked me, he was driving a baby blue and white 1959 Ford convertible - a VERY classy car to the mostly “vehicle-less” girls at Baylor. Of course, that was not the only reason I was excited to have a date with Ed Davis, and it’s a good thing, because when he arrived at the dorm to pick me up he had traded that baby blue ’59 Ford convertible in for a maroon Pontiac Tempest. [Ed notes – the first one with the engine turned sideways.] No matter – I loved him for who he was, not for the car he drove!!! This green '52 Studebaker is what I got after 'the bomb' (described and pictured earlier in this post) bit the dust. Next came the coolest of all cars ever built. At least I thought so - the '63 Vette. So, while we are on the topic of VEHICLES OTHER THAN CARS, check out a vehicle that Thurburn Barker and his family lived and adventured on for a year. Thurburn writes: "In February, 1979, Cathie and I and our two daughters, Janet (then 14) and Heather (then 9) sold our home in Boulder,CO. We bought a sailboat in Sausalito, CA, and spent a year coastal sailing in California. This picture was taken in August, 1979, as we made a passage from Moss Landing to Monterey." Read more about their fabulous adventure at sea on Thurburn's bio page. Ok, everyone is posting photo's of their rides. Next thing you know, Ray Petty will send in a picture of his old chevy which he claimed was named "Chicken Soup". I guess this means a trip to the memory box and dig out some more car shots. Watch your mail box Karla!!! YEA!!!!!!! I can't wait to get a packet from you, John. Of course, you started this line of thinking with your photo of "The Bomb". I think I'll add that photo to this post. Good to hear your voice here again, John! 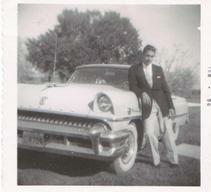 My first car at Milby was a '52 Ford Hardtop (so called because it had no middle post). My buddy, Jody Yeo was with me the night my dad presented me with the keys to that car. I loved it dearly. I still remember Ray Petty's old Chevy that he drove to Deady. He was the only classmate I knew that had a car at Deady. Hi all, I have been checking the blog each morning to read and enjoy some of the amazing feats and ongoing travels that our alumni are experiencing. I am in awe of some of the wonderful treks and selfless acts spoken of here. Then I go back to my meager existence and drink my morning coffee as I answer my mail and send on that which I find interesting or amusing. I enjoy the pics and reminders of the old cars of our school days even though I did not have one. I worked all summer after graduation to earn money for a car. I found a shiny black '50 Ford, with large Unity spotlights, at a service station( you remember those ) on Lawndale next to Jarrel's Plumbing ( David Jarrel's dad's business ) for $250 but I did not have enough money saved up for the purchase so I asked my Dad to help me and surprisingly, he did. My good buddy Calvin Blackman had a black '49/'50 Ford during our last years of school and I thought it was the coolest car around. I remember taking that shiny black Ford with glass pack mufflers out on Memorial Drive on the weekends, rapping it up in 2nd gear and letting those mufflers rack-back around the many curves and thru the trees as my friends and I sang "Thunder Road." And that my friends was my version of Robert Mitchum running from the law with a load of moonshine under the rear deck ! ! What colorful memories the old machines bring back.